Probably no single material is more closely associated with Chaco than turquoise. 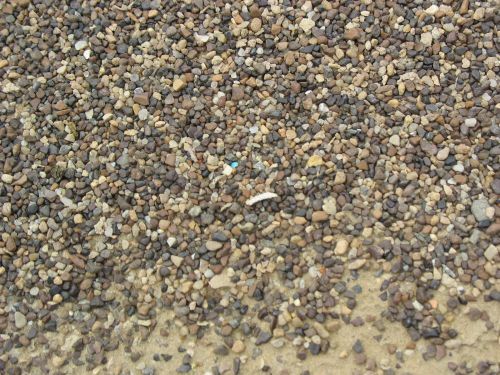 The vast amounts found in Room 33 at Pueblo Bonito alone suggest its importance, but it has been found in considerable quantities at many different sites, both small houses and great houses and both inside and outside of the canyon. There is considerable evidence that manufacture of turquoise jewelry became a major activity in Chaco and some of the outlier communities during the period when the Chacoan system was beginning to form, and probable ornament manufacturing areas have been found at both great houses and small houses. 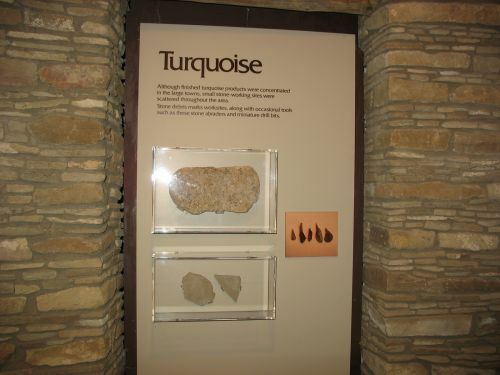 It’s not clear what precise role turquoise may have played in the system (though there are some intriguing possibilities suggested by other lines of evidence), but it is apparent that it was an important one. 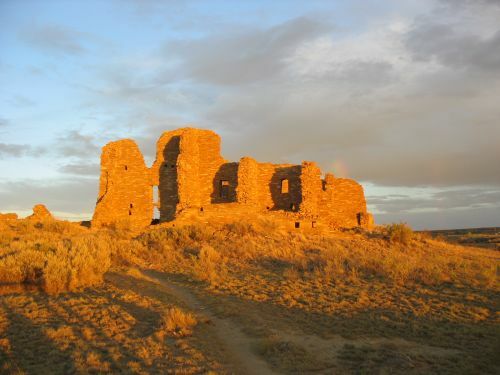 It’s also important to note that unlike some rare artifacts, such as shell trumpets, turquoise seems to have been associated with the system as a whole rather than with Chaco Canyon or Pueblo Bonito specifically. 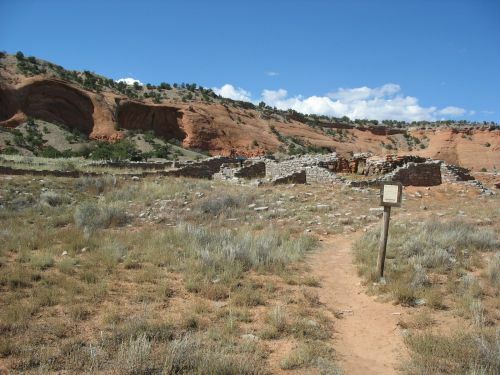 Both finished artifacts and manufacturing debris are found in significant quantities at many outliers, especially to the south in the Red Mesa Valley. What’s really remarkable about this apparent centrality of turquoise is that there are no turquoise deposits anywhere near Chaco, or indeed within the area covered by the Chaco system as a whole. All of this turquoise had to be imported from somewhere, and this importation was clearly occurring on a vast scale and over a relatively long period of time. 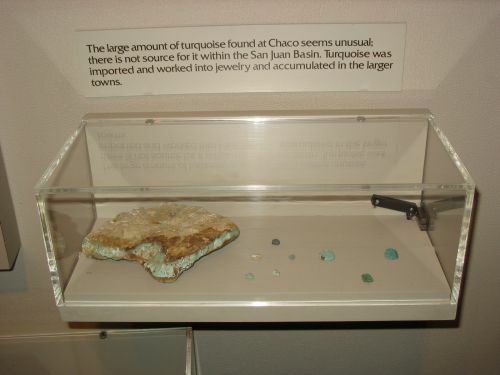 The closest source of turquoise to Chaco is in the Cerrillos Hills south of Santa Fe, which have extensive turquoise deposits that show much evidence of being mined in antiquity (as well as in modern times), including some apparent campsites with material culture suggestive of a connection to the San Juan Basin. 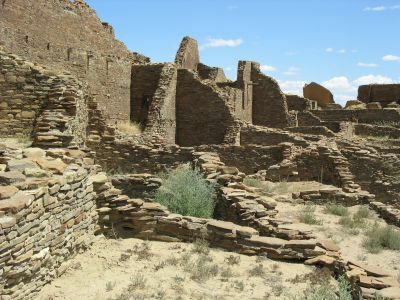 For a long time most researchers assumed that most or all of the turquoise at Chaco came from Cerrillos, and for a while it was fashionable to come up with theories explaining the rise of Chaco as being based on control of the Cerrillos mines and the trade routes connecting them with the vast market for turquoise in Mesoamerica. 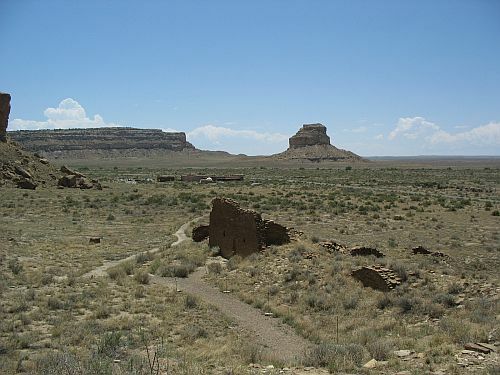 These theories have more recently fallen out of favor for a number of reasons, one being the general trend away from emphasizing Mesoamerican influence on the Chaco system and another being the inconvenient fact that many of the most productive turquoise deposits in the Southwest are in southern Arizona and New Mexico, considerably closer to Mexico than Chaco, which makes it difficult to explain how the Chacoans could have sustained a monopoly on the turquoise trade. This whole issue would benefit greatly from more precise information on the actual source of Chaco’s turquoise. 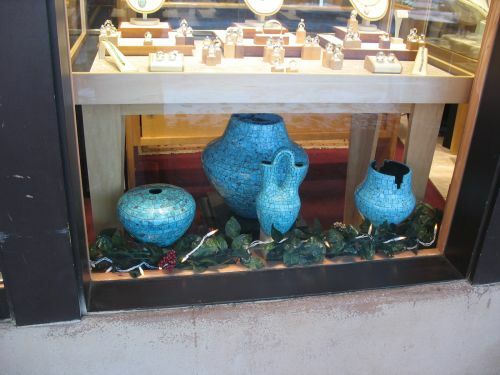 The idea that it came from Cerrillos is basically just an assumption based on geographical proximity, and while it’s a reasonable enough assumption there have been many attempts to use chemical properties of the turquoise to determine its precise origin and either confirm or deny the Cerrillos hypothesis. Most of the early attempts to do this using trace element analysis were unsuccessful, due mainly to the complicated internal structure of turquoise as a material. One recent paper, however, reports on a remarkably successful attempt to use a new technique based on isotope ratios to characterize sources and assign artifacts to them. The technique uses two isotope ratios: hydrogen to deuterium and copper-63 to copper-65. The combination of the two ratios can be used to define a two-dimensional space within which individual samples can be placed to determine if samples from the same source cluster together. It turns out they do. 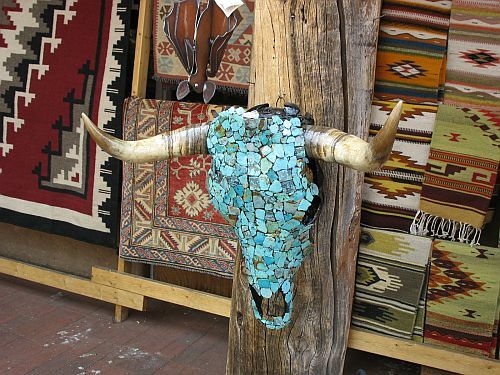 The researchers used samples from a variety of Southwestern turquoise sources, most of which show clear evidence of having been used in antiquity, including three in the Cerrillos area, one in southern New Mexico, two each in Colorado and Arizona, and four in Nevada. 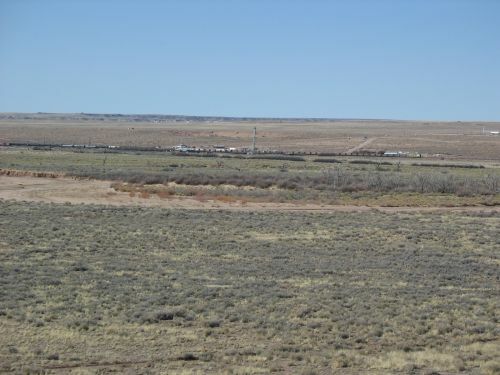 They analyzed several samples from one of the Arizona mines to test internal variation within a single source. There turned out to be little variation, suggesting that individual sources generally have homogeneous isotope ratios, and the three Cerrillos sources also clustered close to each other, suggesting that this similarity in ratios operates at a regional as well as local scale. 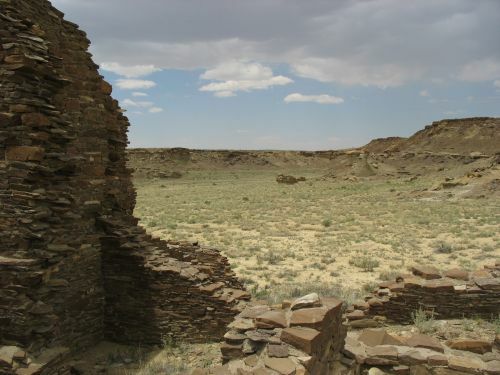 The researchers also tested several pieces of turquoise found at several small houses in Chaco Canyon and one at the Guadalupe outlier community, which marks the far eastern edge of the Chacoan system and is the closest Chacoan community to Cerrillos. Guadalupe plays a key role in models of Chaco that posit Chacoan control of the Cerrillos mines, since any transport of turquoise from Cerrillos to Chaco would almost certainly have to have involved Guadalupe as an intermediate stop. 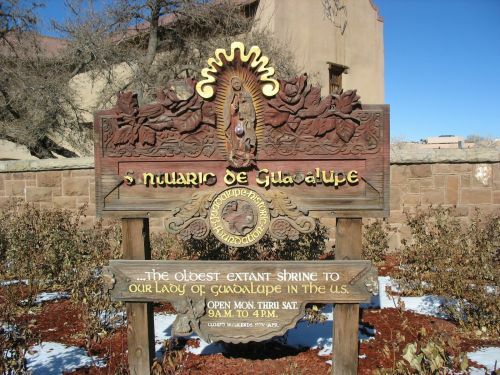 Guadalupe is thus probably the outlying community most relevant to an investigation of Chacoan turquoise sources. The results were interesting. 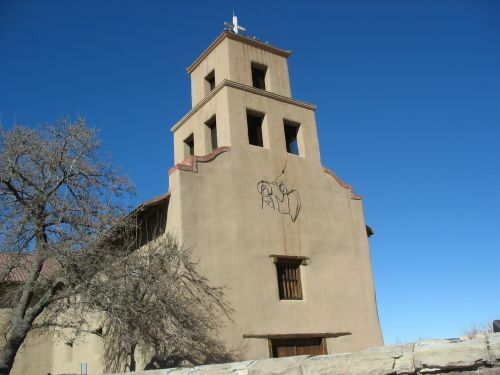 Several of the artifacts seem to have come from Cerrillos, with a much higher proportion at Guadalupe than at Chaco, but a few other sources were present as well, including one of the Colorado sources at Guadalupe and the southern New Mexico source and two Nevada sources at Chaco. Four artifacts matched none of the sources tested, implying that they came from some other, as yet unidentified, source. The Chaco artifacts came from a wide range of chronological contexts, with earlier periods more strongly represented than later ones. The Guadalupe artifacts unfortunately didn’t come from a securely dated context, so nothing much can be said about their relative or absolute chronology. 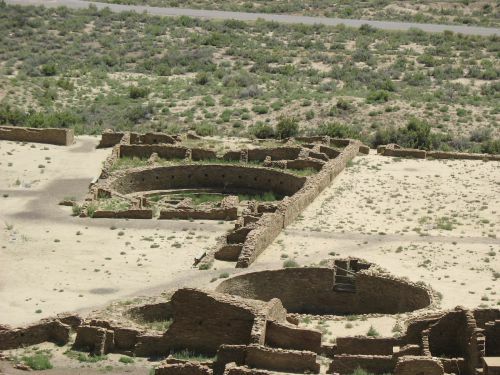 In general, the Chaco artifacts seem to have come from a wide range of sources in all time periods, but the sample size is so small that it is hard to come to any more specific conclusions. This paper is really just a pilot project, intended primarily to demonstrate the methodology used, and the conclusion mentions that continued research using more sources and artifacts is underway. 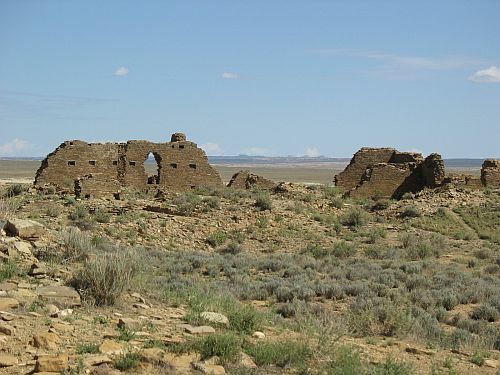 The main conclusion that can be drawn at this point is that assuming all the Chaco turquoise came from Cerrillos is no longer warranted, and it seems the trade networks in the prehistoric Southwest were much more elaborate and far-flung, at least for valuable, portable materials like turquoise, than such an assumption would suggest. Chaco may or may not have been primarily about turquoise, but it certainly wasn’t about Cerrillos turquoise. One of the more confusing aspects of the geography of the Southwest is the fact that there are two completely different rivers with the exact same name, and they’re quite close to each other. 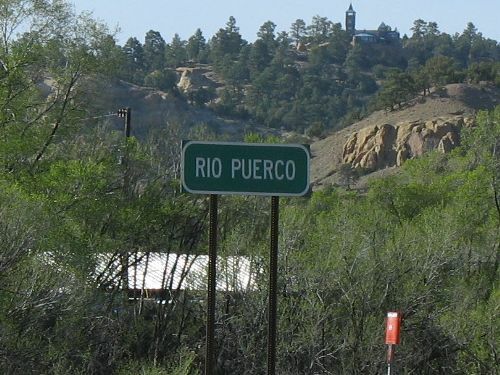 The name is “Rio Puerco,” meaning “dirty river” in the New Mexico dialect of Spanish. It’s an apt name, since rivers in the area tend to carry a lot of sediment and the water in them tends to look rather dirty. Nevertheless, the use of it for both rives can lead to considerable confusion, and while in technical and scholarly contexts they tend to be carefully distinguished, in more accessible public contexts there isn’t much clarification out there. 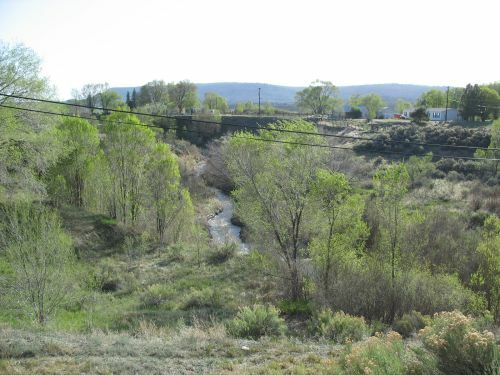 One Rio Puerco originates in the Jemez Mountains and flows south through the village of Cuba, then parallels the Rio Grande for a considerable distance before joining it south of Belen. In contexts where careful disambiguation is necessary this river is generally called the Rio Puerco of the East, on maps and signs where highways like US 550 cross it it’s usually just labeled “Rio Puerco.” Today the Puerco of the East forms a rough eastern boundary for the Navajo culture area, and the communities along it (especially Cuba) serve as important points of contact between the Navajos and the New Mexico Hispanic culture area. 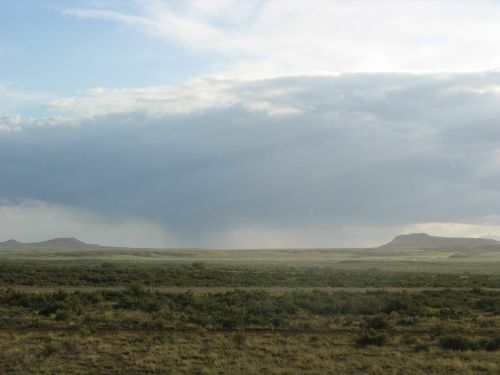 The other Rio Puerco originates on the southern slope of Lobo Mesa near the Continental Divide and flows generally southwest through Gallup and the Red Mesa valley, paralleling the railroad and I-40 into Arizona. 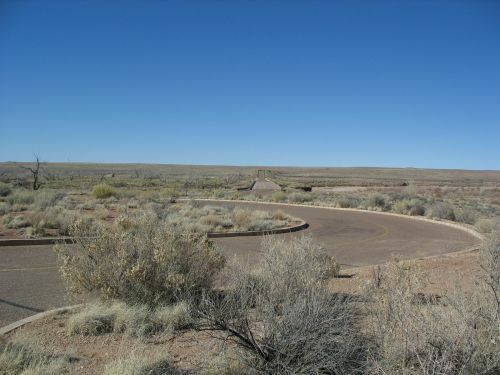 It passes through Petrified Forest National Park before flowing into the Little Colorado River at Holbrook. 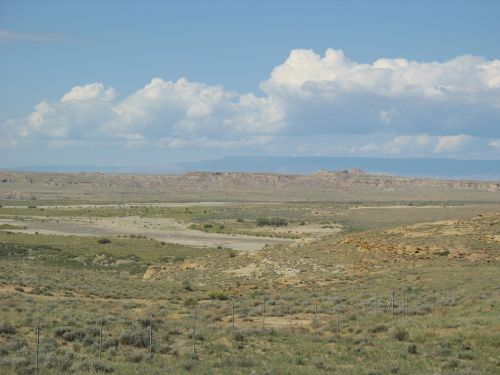 This river is generally called the Rio Puerco of the West, and it forms a very rough southern boundary for the Navajo culture area, with the area further south dominated by the Zunis along the eastern portion and by Anglos (largely Mormons) along the western portion. 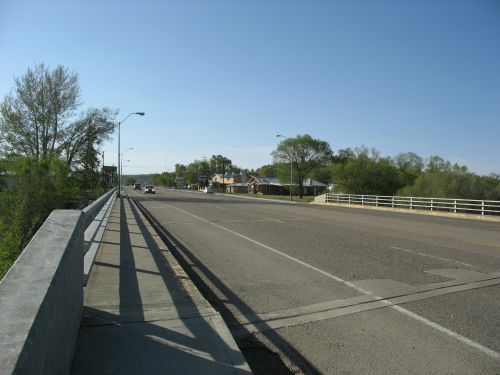 The towns along the river are mostly nineteenth-century railroad towns. Clearly, these two rivers are very different and have nothing to do with each other. They are on opposite sides of the Continental Divides and belong to completely different drainage systems: the East flows into the Rio Grande and ultimately into the Gulf of Mexico, while the West flows into the Little Colorado, which flows into the Colorado just upstream from the Grand Canyon and ultimately ends up in the Gulf of California. Confusingly, though, they’re really quite close. If you drive from Albuquerque to Flagstaff on I-40 you cross both of them, and each is marked only by a sign saying “Rio Puerco.” They are also both close to Chaco, and both areas were integrated into the Chacoan system, though probably to different degrees. 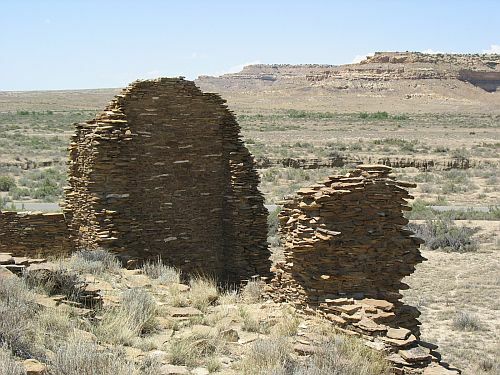 The only major Chacoan site known from the Puerco of the East is Guadalupe, while the Puerco of the West has a whole string of sites that have been identified relatively recently as Chacoan outliers, including Allentown, Chambers, Sanders, and Navajo Springs. Unfortunately, the names are so entrenched at this point that there’s little prospect of changing either (or both) to something less confusing, so it looks like this is something we’ll just have to keep dealing with. Hopefully this post will help reduce the amount of confusion over this issue.